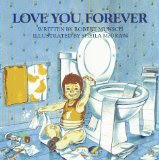 I didn't have kids when I first learned of Robert Munsch's book titled Love You Forever . In one episode of the TV Series "Friends," Joey reads from a children's book for baby Emma's first birthday. I'll never forget watching that particular episode. Joey's dramatic reading of Love You Forever made everyone all teary-eyed. The book starts out with a mother rocking her baby boy and singing a lullaby of love. As the boy grows older, his mom takes the time to steal in at night and rock him, still singing the same lullaby. He grows up and reachs adulthood and she climbs through his window to sing him the song and watch him sleep. The son later returns the favor and sings his elderly mother the song. Finally, as the story comes full circle, the son becomes a parent himself and shares the special lullaby with his own child. Robert Munsch wrote this book as a memorial for his two still-born children. The book started out as the song and grew from there. I received my own copy of the Love You Forever as a baby shower gift. After having kids, I've never been able to read the book without crying. My daughter always wonders what in the world is wrong with mommy. She does really like the book, especially the parts where I sing. I made up my own little tune for the song verses from the book. Some don't think the book is particularly appropriate for children, but I disagree. Children should have an understanding of the circle of life and the aging process. The book makes me cherish the the time spent rocking my children even more. Every parent should take the time to read this precious, touching book and sing the lullaby to their children. The website includes a downloadable MP3 audio file of the book. I love listening to Robert Munsch sing his version the lullaby verse. It differs from my own. Robert Munsch's website is one of the best author sites I've visited. His virtual story room features a ton of books available for online listening. I was given this book when my oldest was born. I love it and still tear up when reading it. I was also given this book when my son was born and it is still my favorite book! It always brings a tear to my eye! We love this book! My mother in law had it & would read it to my kids over & over. So I bought a copy for each of them for when they have kids. Robert Munsch is such a great author! !